Hey, so J went back to school for his last semester of college (How is this possible? Have almost 7 years really gone by? )…so I am taking on the big city by myself for the next four months. Not that I won’t be ridiculously busy with my job, in which I it feels like I wear 5000 hats per day. No, I will have plenty to keep up with. However, it is a lot more quiet here now. So, I’m “roughing it” in the apartment, learning how to cook for one a)without spending a fortune, b)while trying to stay healthy and c)without wasting a lot of food by letting it go bad. Here is my plan for this week: make three dishes, freeze in single-portions, and rotate with fresh fruits and veggies. Now, until this summer, I had never made one before. However, J ate the last one with such vim and vigor, I figure I did something right. Also, it is a healthier version, as I got the recipe from Skinnytaste, my favorite food site ever. Chop, boil, drain potatoes. Mash with chicken broth (I used low-sodium), sour cream, s&p. Brown ground turkey; saute onion, garlic in oil, then add mushrooms, celery, flour, s&p. To that big ‘ol pot, add beef broth, tomato paste, rosemary, thyme and meat. 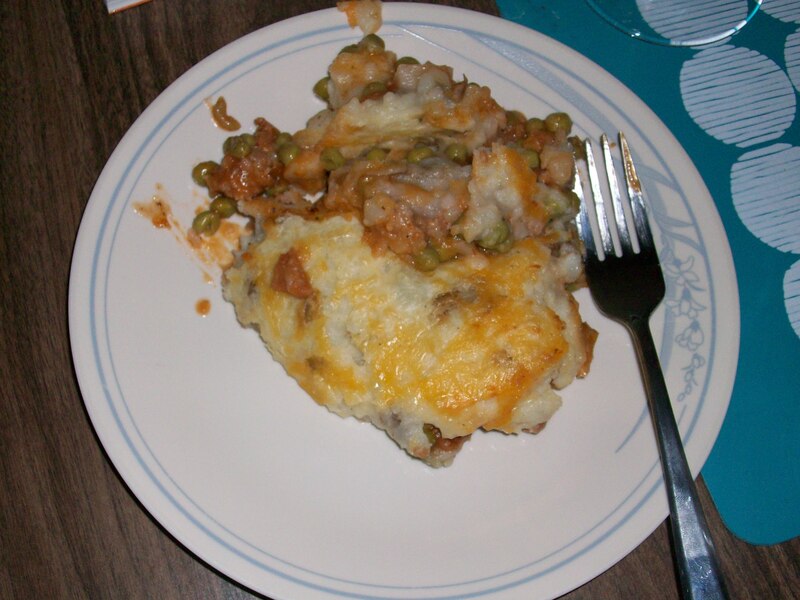 In a baking dish, spread meat-y vegetable-y stuff, top with mashed taters. Sprinkle with paprika, bake for 20 mins. YUM! 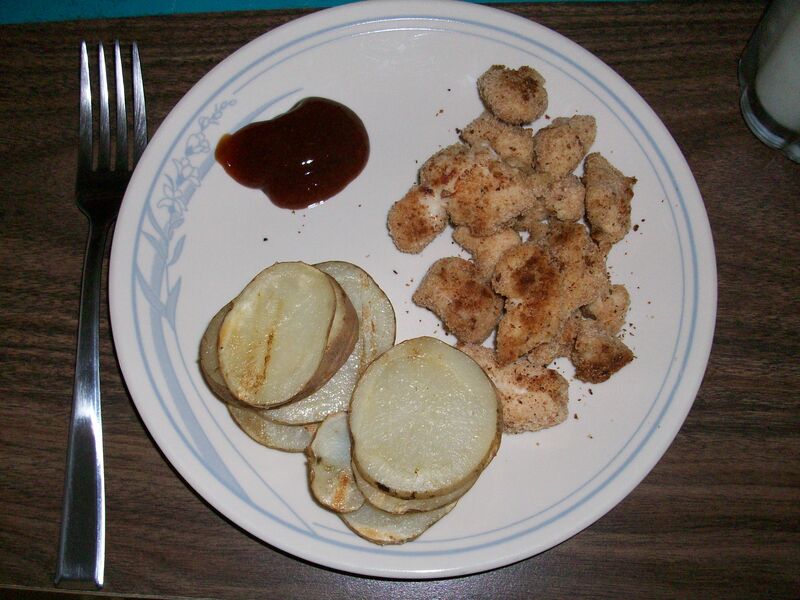 Under 300 calories, too! What we forgot to blog about…get ready- it’s a long one. Agenda: 1. Twin weekend recap, 2. 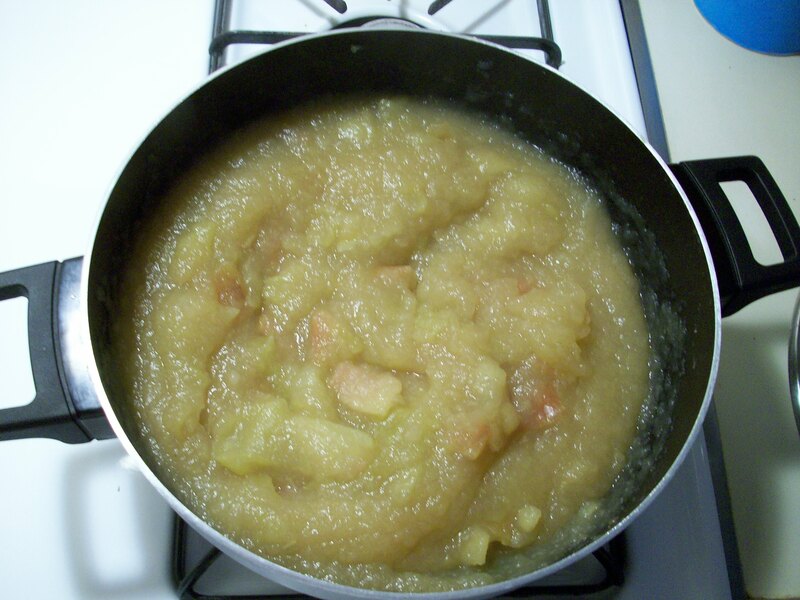 I made applesauce!, and 3. I made lattes! 1. So, like we said B and B were here, having a great time exploring our lovely little part of town. We live in a hippy-esque neighborhood near campus, which is a lot of fun. There are lots of bike-advocacy groups, free-trade coffee clubs, and a lettuce of the month club. Also, we found ice cream in our village that is made from white wine and wheat grass. Watch Portlandia, and you will get a sense of our town. While they were here, we went to the farmer’s market, had a picnic in the rose gardens, and had a fancy homemade dinner (made by B.2 and myself). At the market, we bought a lovely mild cheddar, a garlic/asiago loaf, some apples and pie. I also made a nice pitcher of peach iced tea. Because I am Pinterest-happy, I found a cute idea of making ice cubes out of tea, which stops the tea from diluting with regular water ice cubes. For an extra special touch, I put peach slices in the cubes- YUM! 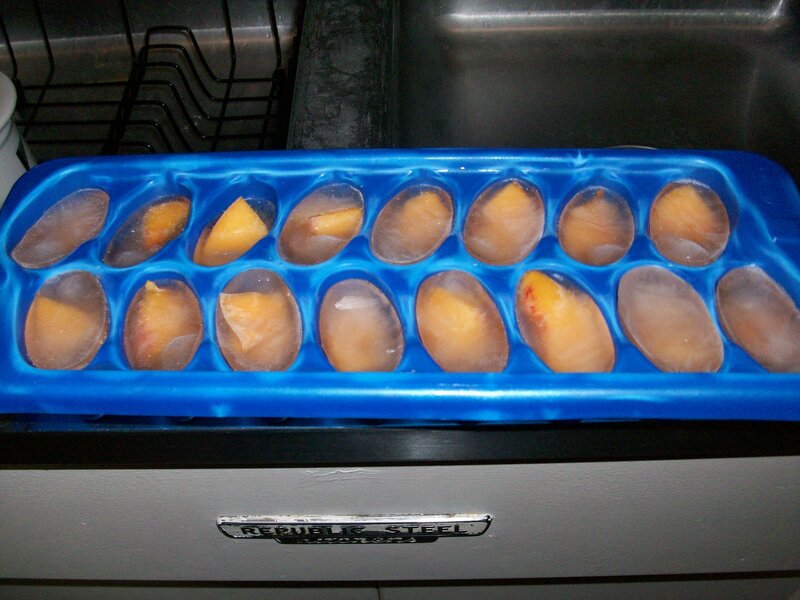 Peach tea and peach slice ice cubes! YUM! 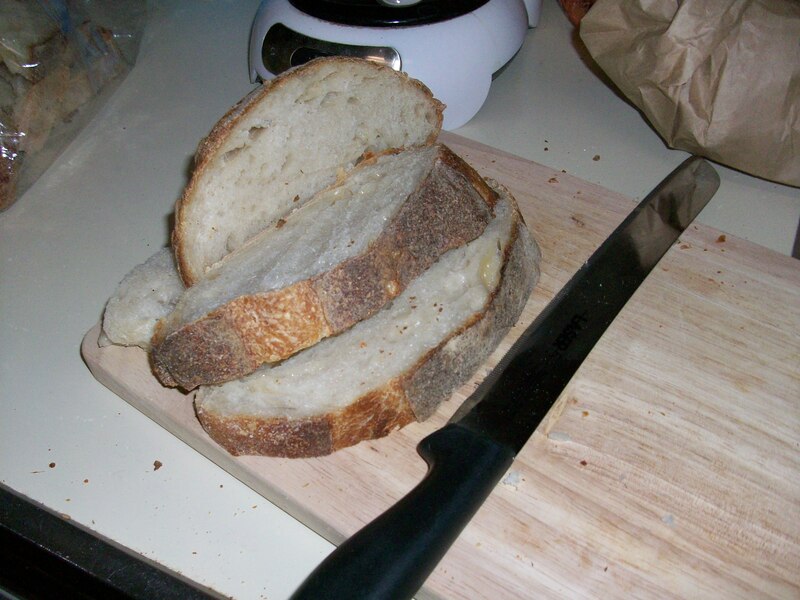 Garlic-asiago loaf from the Bread Guy…I think his name is Dan. 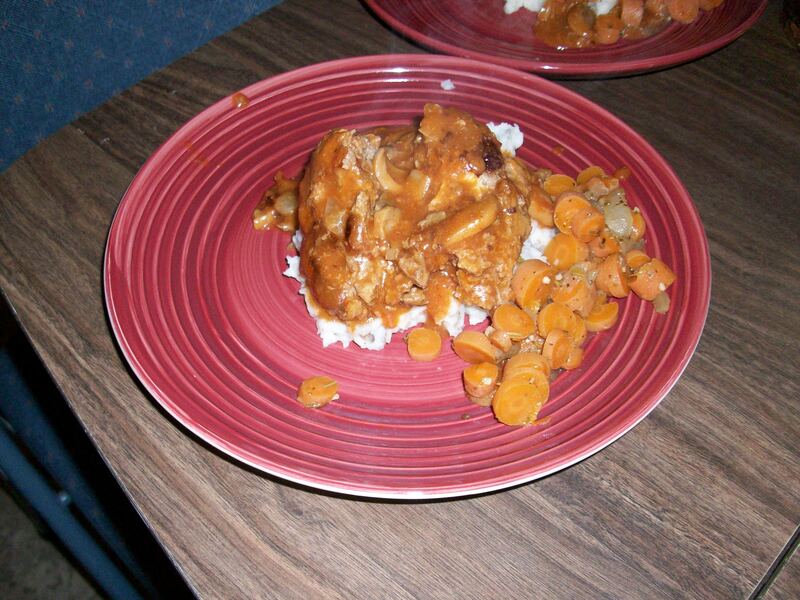 Salisbury steak atop a pile of roasted-garlic mashed potatoes and a side of French-cooked carrots. Bon appetite! 2. Applesauce. Remember when I said we bought a bunch of apples at the market. We ate a total of three at the picnic, which left me with almost 1/2 peck of apples. What to do? Applesauce. Heat to boil, then simmer. This took about twenty minutes. When the apples have broken down, add some cinnamon (I just threw some in-not big on measuring apparently), and stirred. I then scooped the thick applesauce into containers, one for eating and one for freezing (it freezes quite well. 3. LATTES! I just had one, which gave me enough energy to write this freakishly-long post! Coffee! While espresso is brewing, make own vanilla syrup: 1/4 cup of sugar and 1/4 cup water in saucepan, bring to boil, turn off heat and add 2 tablespoons of vanilla. Stir and refrigerate leftovers. 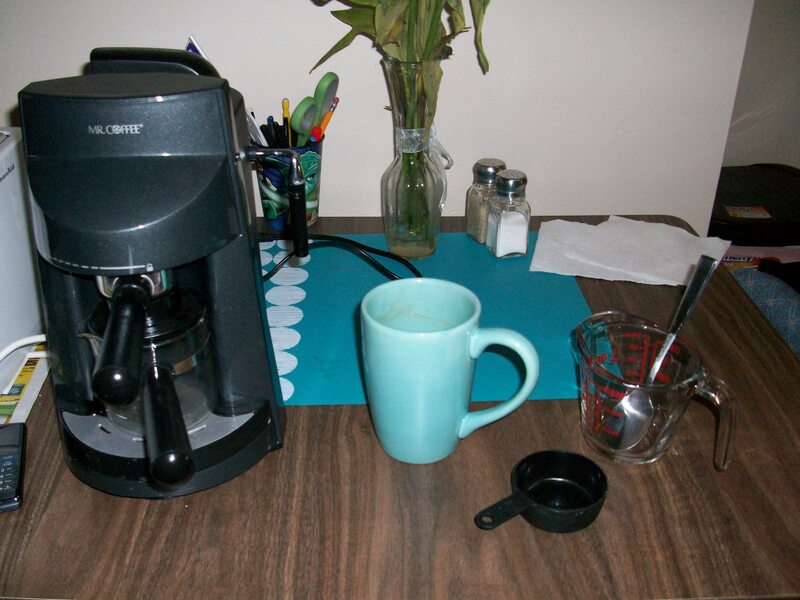 Pour espresso into cup, add in as much syrup as you want (couple of tablespoons), pour milk in, and top with frothiness. Apologies for the LONGEST POST EVER. We’re still working on this whole blog-everyday-so-you-don’t-have-ridiculously-long-blog-posts-thing. We have a tiny kitchen. Built in the ’50s. It uses gas. It probably worked quite well when it was new. It is no longer new. But, L and I (but mostly L) still manage to create some excellent dishes. The stove’s burners are each labeled with a gradual level of heat, ranging from “low” to “medium” to “high”. A more accurate set of labels would read “High”, “Scorching”, and “A heat rivaling only that of the sun’s surface” (about 5778° K, or 5505° C). Nonetheless, we’ll deal with it until we find a new place, hopefully sometime by next May. 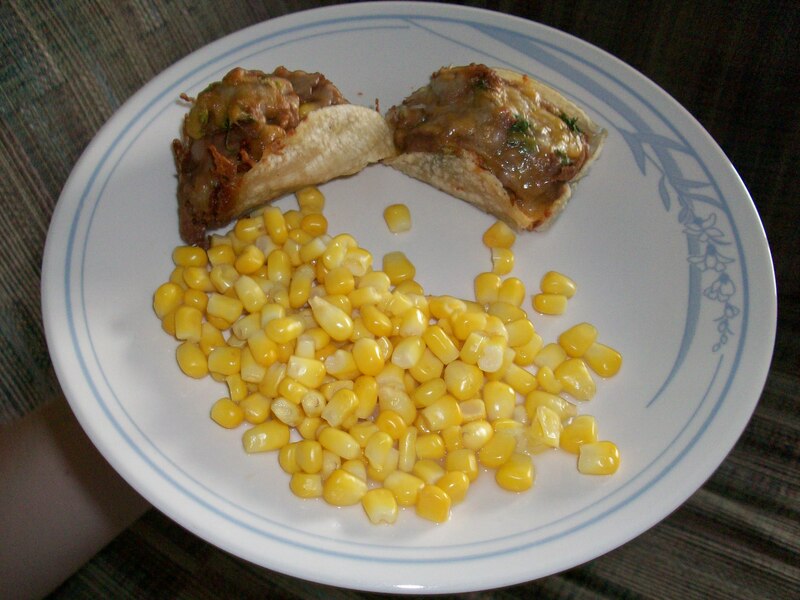 Yummy taco babies with corn. Preheat oven to 325°. Grease up a muffin pan. cut the tortillas into fourths. Slap one into each muffin space. IN A BOWL: Mix together the beans, about half the corn, and a good shake of chili powder. Scoop a spoonful of that into each tortilla. Put some cilantro and cheese on top. Bake for 15 mins. Serve with the rest of the corn. YUM. The smudgy bit is barbecue sauce. L eats hers with honey mustard. L made a thing out of another thing. 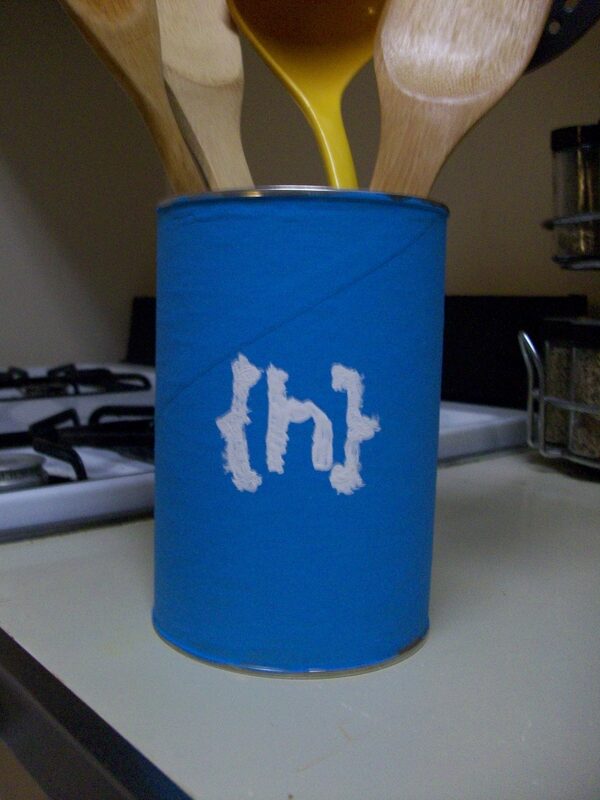 Upcycled cocoa mix can becomes useful utensil-holder thingy! She made the monogram herself, and painted it on with a sponge, reminding us that we should get her paintbrushes back the next time we visit our parents.